"Marriage is an ethnic weaving together of families, of two souls with their individual fates and destinies, of time and eternity--everyday life married to the timeless mysteries of the soul " "Marriage is a door which looks out upon a beautiful view. As that door is opened and the horizon unfolds before you, know that nothing is sweeter than the warmth of one hand within another ". 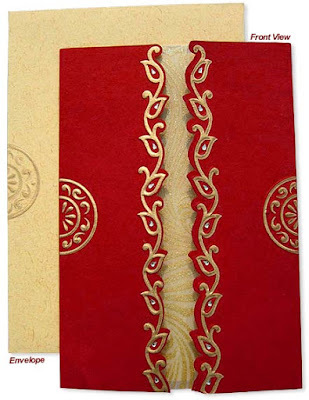 This red colored wedding card says nothing but still reveals all secrets of the Hindu tradition. Face mantled with two-way opening with the work of glittering provides shining path to the valued guests. A gleaming Wooly paper inside ties two plain sheets of the invitation card. The envelope, card and the pain sheets, all are decorated with the same pattern of designs. Thus, leaving no words unsaid to shower a warm welcome over the visitors. "Thanks for the beautifully wedding cards." "Sorry for my delayed response. I got the cards 2 days ago. Fantastic job! Keep up the good work. I really like teh prompt, efficient service you provided. I will highly recommend your website to others as well. "I would just like to say that I recieved the invittions today and they are perfect. I just want to thank you and your team for doing such a wonderful job on the invitations and making the whole process so easy. Ashish Abrol is the founder and CEO of Big Indian Wedding, a wedding portal that caters to all your wedding needs. Get FREE wedding tips, Discounts and Coupons on attire and make up by logging in to Big Indian Wedding. You may also checkout Indianweddingcard.com for more collection of Unique Wedding card Designs. Hello, I love reading through your blog, I wanted to leave a little comment to support you and wish you a good continuation. Wish you best of luck for all your best efforts. Arya Samaj Meerut, Arya Samaj Wedding. Hello, I love reading through your blog, I wanted to leave a little comment to support you and wish you a good continuation. Wish you best of luck for all your best efforts. arya samaj marriage, arya samaj wedding. AllWeddingCards.com, an emerging pioneer in the field of Indian wedding cards, traditional wedding invitations and stationary. The company started on a small scale and gradually the bud bloomed into a fragrant blossom. We offer the best Indian Wedding Cards, Hindu Wedding Cards, Sikh wedding Cards and choose from a wide variety of quality Indian Wedding Cards. Let’s visit most exquisite and exclusive Indian wedding cards for your upcoming dream wedding and order us for free wedding invitation samples. Hi there. Nice blog. You have shared useful information. Keep up the good work! This blog is really interesting and gives good details. Arya samaj marriage Delhi, Arya samaj marriage in Delhi. Before wedding the one of the main thing is sending the invitation to the relatives. So designing the Budget wedding invitations is much necessary. As the design of this wedding invitation is very nice. Interesting and useful detail about the wedding cards and greeting cards nice work. Amazing article. I am so impressed. Hello!! Nice blog! Everyone want to design unique wedding invitation cards for their wedding so make this process easy & the process of crafting custom wedding invitations might seem simple if you take the help of a seasoned Toronto wedding invitations printing agency. Great article, It's one of the best content in your site. I really impressed the post. Good work keep it up. Thanks for sharing the wonderful post. We are initially Utsav International from India. Our web presence with www.utsavweddingcards.com serving the globe our highly designed manufactured wedding invitations with 16+ years experience.